Recreated ZX Spectrum – App Now Available for Android Phones & Tablets. Roadmap Announced. To coincide with today’s release of the Android app Elite, the 1980s publisher behind the recreated device, has released information about how it’s expected to be used along with a roadmap outlining how the Recreated ZX Spectrum will be enhanced through further apps and firmware updates. 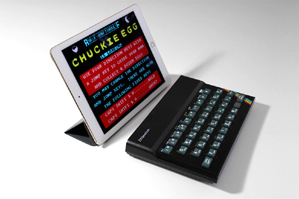 A survey of more than 275 users revealed that only 44% expected using the recreated device solely or primarily for playing ZX Spectrum games, whilst 49% placed equal or greater importance on its use as a keyboard for use with phones, tablets, Macs, PCs and connected TVs. Further apps are currently in development for the recreated device, one for the soon to be released 4th generation Apple TV, the other for Android TV. Both of the forthcoming apps will include Chuckie Egg, Sinclair BASIC and a huge game bundle. When available, the apps will enable games and applications to be played on connected TVs using the Recreated ZX Spectrum – without the need for an intermediate device such as a phone or a tablet. – follow the on-screen instructions. It’ll only take moments. This entry was posted in 2, Developer, game, games, Games Developer, mobile, train, train 2 game, Train2Game, www.train2game-news.co.uk and tagged 2, Android, developer, game, games, Games Developer, games industry, train, Train2Game, ZX Spectrum by Train2Game Blogger Team. Bookmark the permalink.